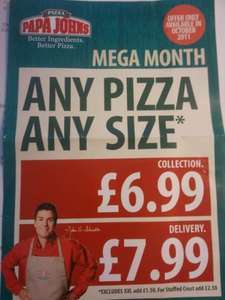 Got a leaflet through the door and it explains that any pizza up to XL is £6.99 when collected and £7.99 delivered. For XXL its an extra £1.50 and for stuffed crust its an extra £2.50. It is also only available till the end of OCTOBER 2011. Can't find anything on their website so must have to phone. Do you have a larger scan of the menu, and is there a reference number of some sort? any1 know how big the xxl actualy is? They also have buy one get two free (excludes small, medium and large and XXL). They also have buy one get two free (excludes small, medium and large and … They also have buy one get two free (excludes small, medium and large and XXL). Oh good, does that mean I could get an XL on any day not ending with a 'y' ? Called up my local Papa Johns, they haven't heard of this and asked for a code. Oh good, does that mean I could get an XL on any day not ending with a … Oh good, does that mean I could get an XL on any day not ending with a 'y' ?